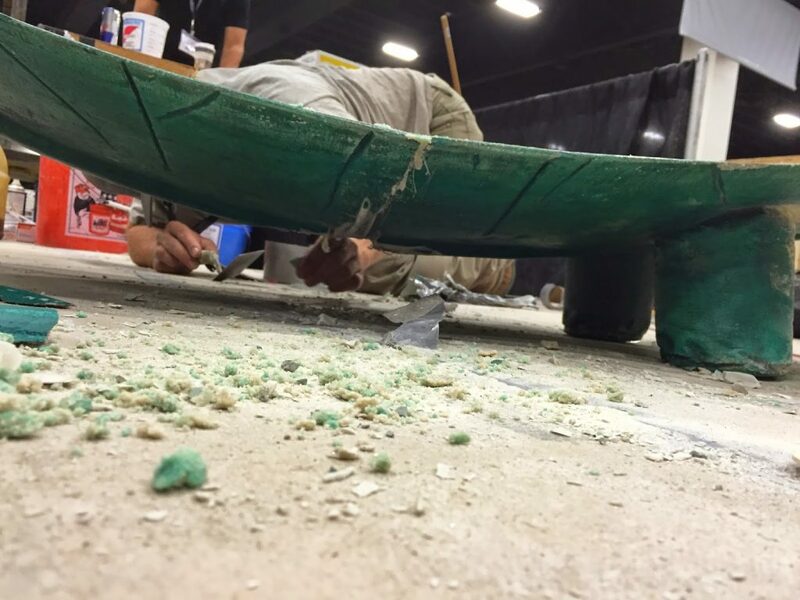 Use Concrete Mender™ to repair cracks, joints and curling slabs under VCT or tile floors. The permanent performance and 10 minute cure turns this 2 day job into a one day (or one night) job. Keep business running with minimal down time. Repairing contraction joints under VCT. 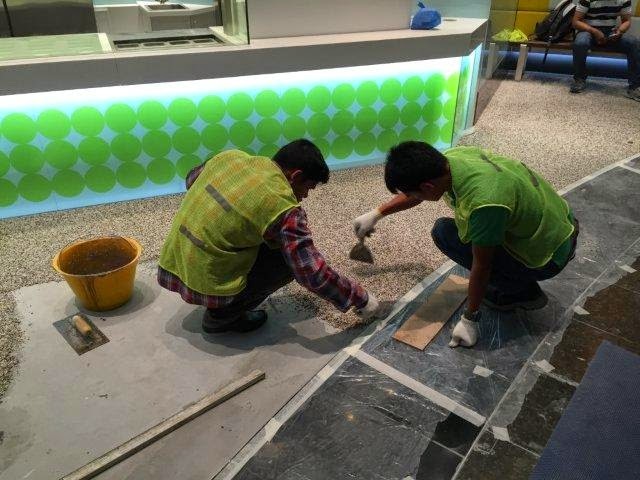 For spalled or failed control joints that are reflecting through the tile and the slabs are not curled, clean out the joints with a dust collecting diamond grinder. Control or contraction joints repaired with 10 Minute Concrete Mender™ under VCT. Repair the control joints with Roadware 10 Minute Concrete Mender™, grind the surface flush and replace the tile. For curled and buckled slabs, a major retailer specifies this heavy duty solution. This is the ultimate fix it once and fix it forever repair. 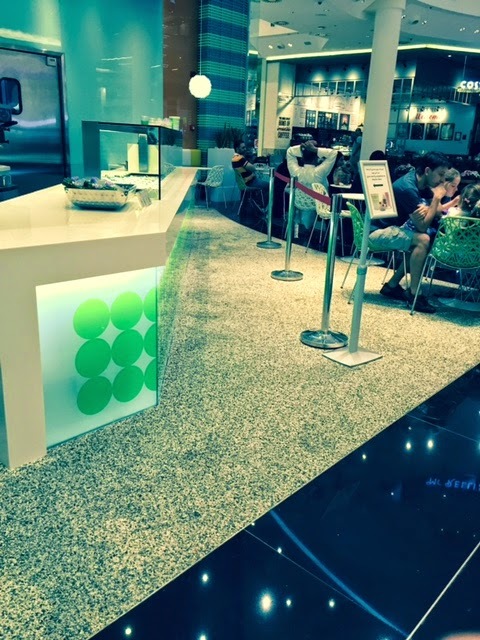 Step 1: Remove VCT, Ceramic, or vinyl floor coverings. Step 2: Saw cut parallel lines to the crack at a depth of no less than 1.5 inches. Ideally 30% of the slab depth. Step 3: Chip out the concrete between the saw cuts. Clean the surface well with a wire brush and vacuum. Step 4: Add Roadware 10 Minute Concrete Mender and Sand to the finished grade. Also use Concrete Mender to repair the underlaying crack. 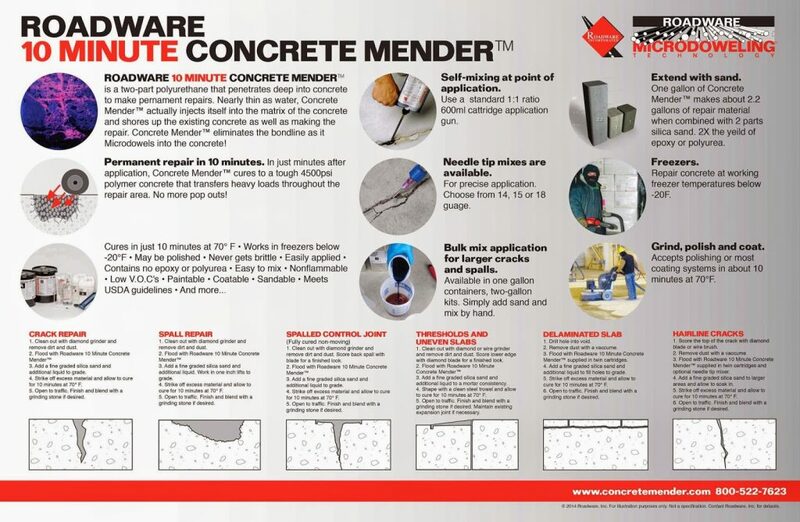 See Concrete Mender™ Bulk Application Instructions. Step 5: Replace the floor treatment and open to store traffic. 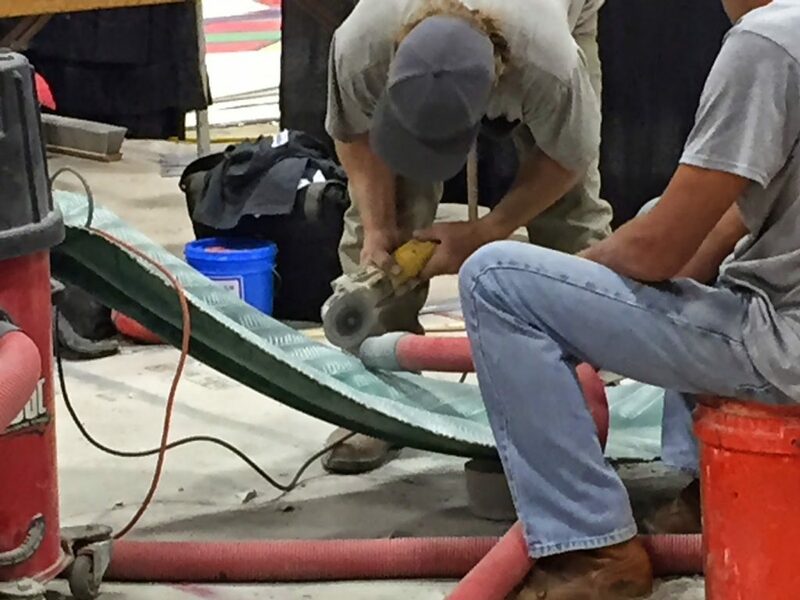 Repairing seasonal pop-outs in stamped and colored concrete is easy with MatchCrete™ Clear. 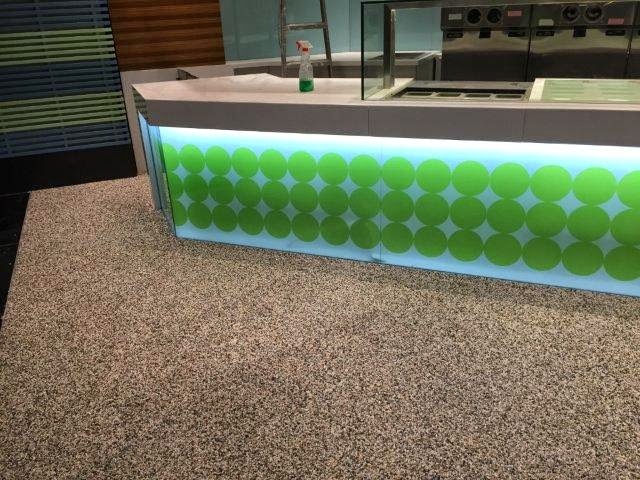 Just add some powered pigment or grout to the clear MatchCrete™ aliphatic polyurethane and you can match most any color. Come back after 24 hours and give the repairs a light sanding to blend them in. See the short video below. 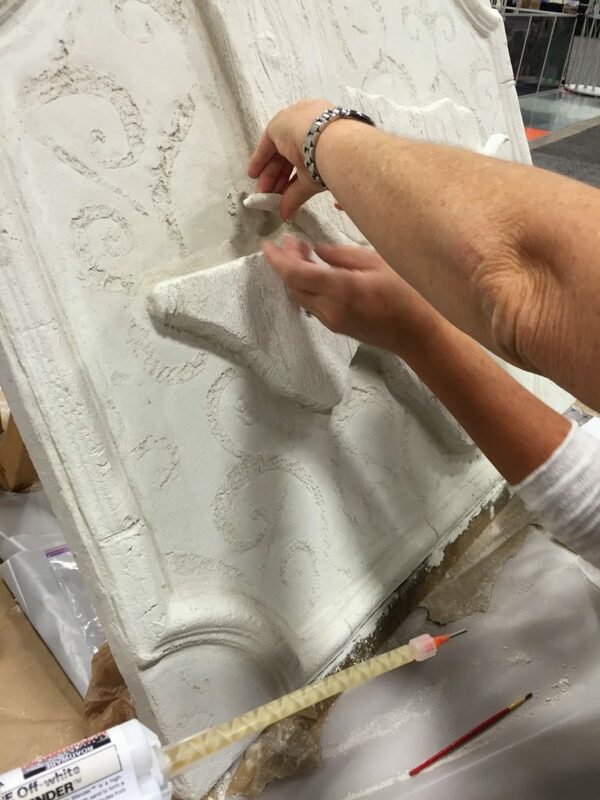 Repairing pop-outs in stamped decorative concrete with MatchCrete™ Clear and added dry pigments. Roadware products have a new look. Use the high-penetration abilities of Roadware 10 Minute Concrete Mender™ to make full depth crack repair. 1. Clean out with diamond grinder and remove dirt and dust. 3. Add a fine graded silica sand and additional liquid to grade. 4. Strike off excess material and allow to cure for 10 minutes at 70°F. 5. Open to traffic. Finish and blend with a grinding stone if desired. 3. Add a fine graded silica sand and additional liquid. Work in one inch lifts to grade. 1. Score the top of the crack with diamond blade or wire brush. 2. Remove dust with a vaccume. Mender™ supplied in twin cartridges and optional needle tip mixer. 4. Add a fine graded silica sand to larger areas and allow to soak in. cure for 10 minutes at 70° F.
1. Clean out with diamond grinder and remove dirt and dust. Score back spall with blade for a finished look. 1. Drill hole into void. 2. Remove dust with a vacuum. Mender™ supplied in twin cartridges. additional liquid to fill holes to grade. 1. Clean out with diamond or wire grinder and remove dirt and dust. 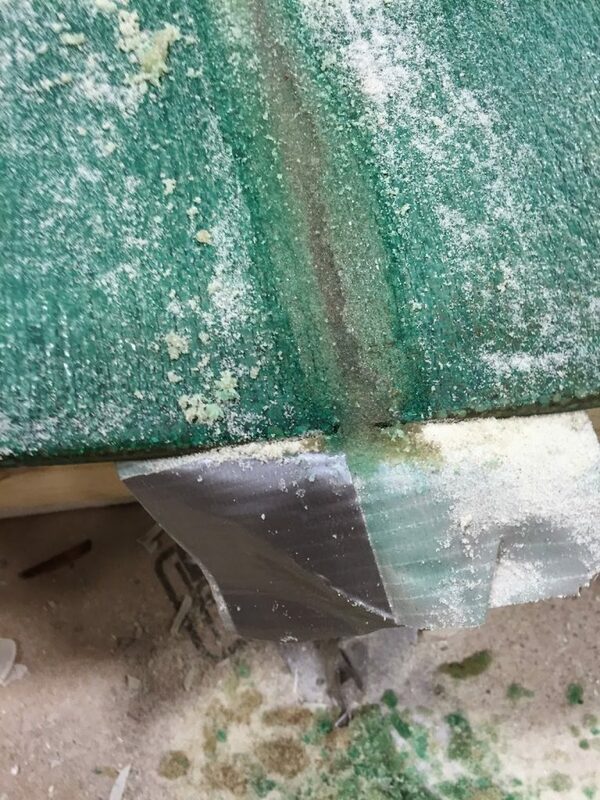 Score lower edge with diamond blade for a finished look. 3. Add a fine graded silica sand and additional liquid to a mortar consistency. 4. 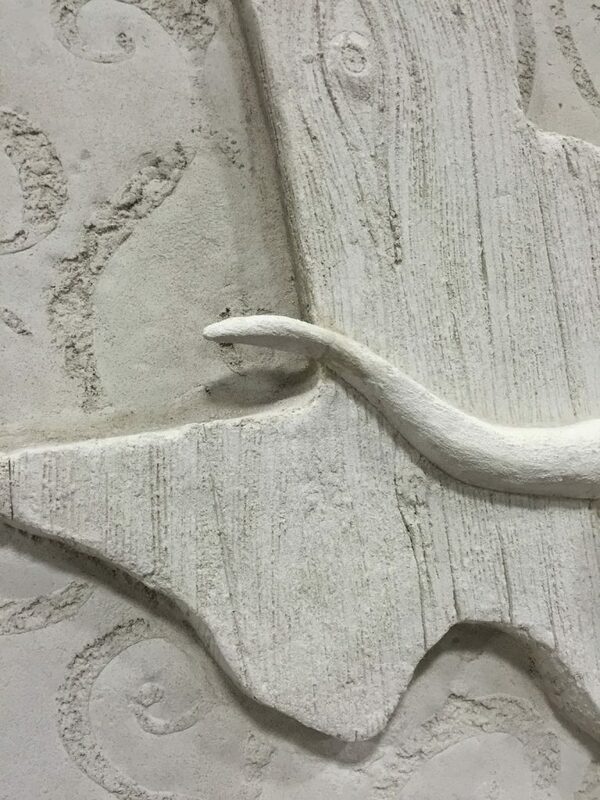 Shape with a clean steel trowel and allow to cure for 10 minutes at 70° F.
5. Open to traffic. Finish and blend with a grinding stone if desired. Maintain existing expansion joint if necessary. 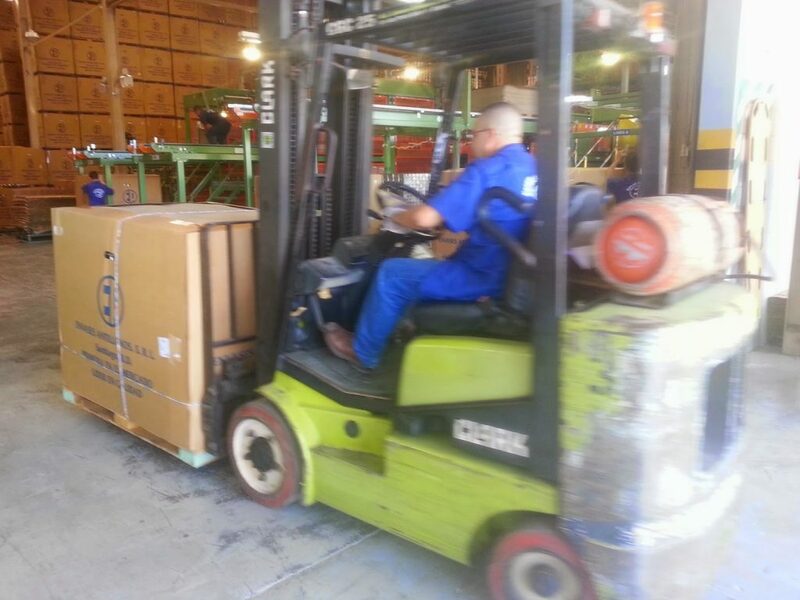 Warehouse Floor Repairs in the Dominican Republic. 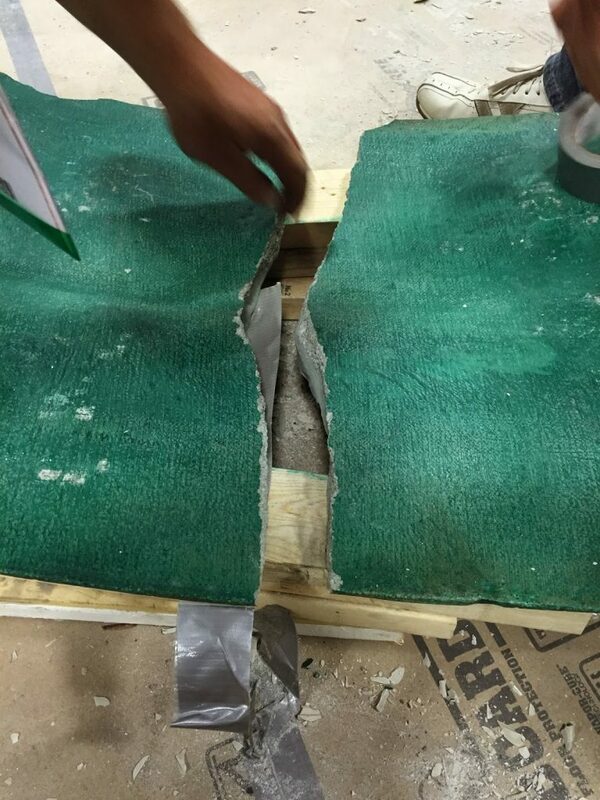 Franklin Gutierrez in the Dominican Republic is using Roadware 10 Minute Concrete Mender™ to repair multiple spalls in a warehouse floor that were causing damaged forklifts and damaged backs. “We did 87 repairs for this client, it is a tin can production plant, they work 24/7 so there was no time to close areas for repairs , also lots of equipment very sensible to dust in the air. The major problem was that those small holes were damaging the wheels of the forklifts, damaging the back of the operators and creating possible dangerous situations for the forklift operators, because they manage very heavy loads and even a small hole could make it unstable. We did all in two days and the client is very very happy, the problems were solved and there was no interruption for them. Loose materials are removed from the spall. 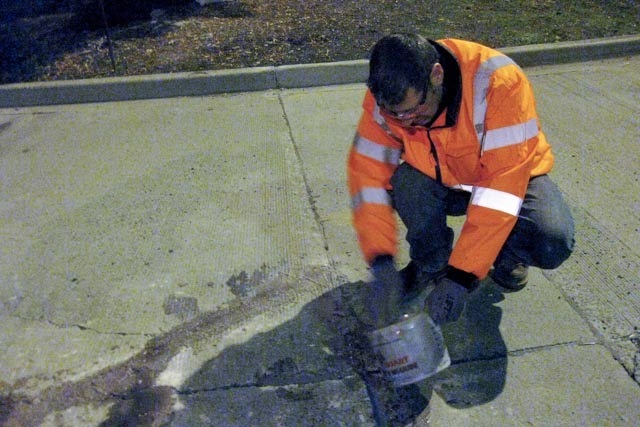 Bulk Roadware 10 Minute Concrete Mender™ mixed with sand is troweled into the spall. See instructions here. Heavy forklift traffic can be restored in about 10 – 20 minutes depending on the temperature. 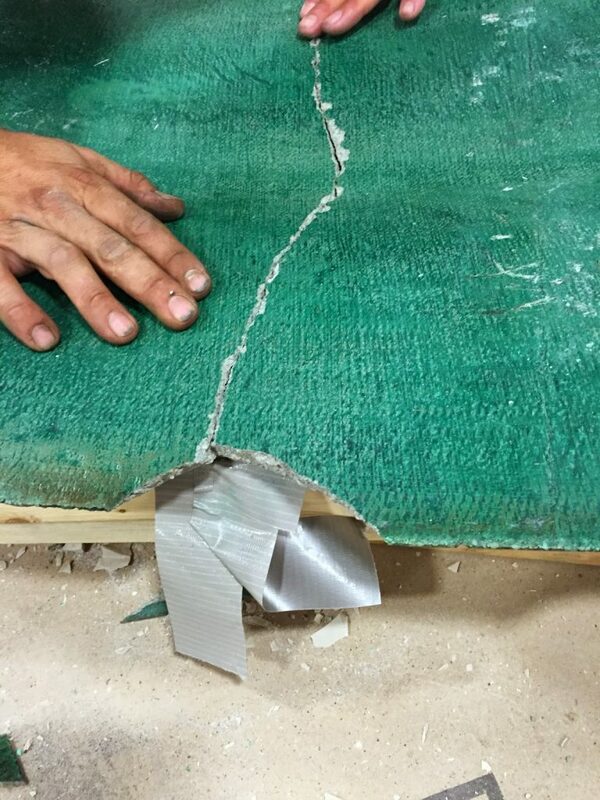 Roadware 10 Minute Concrete Mender™ with Microdoweling™ performance creates structural concrete repairs that will hold up under the toughest warehouse floor applications. Even if the warehouse is for frozen food and -20F or colder. Use Roadware 10 Minute Concrete Mender™ to repair concrete statuary. 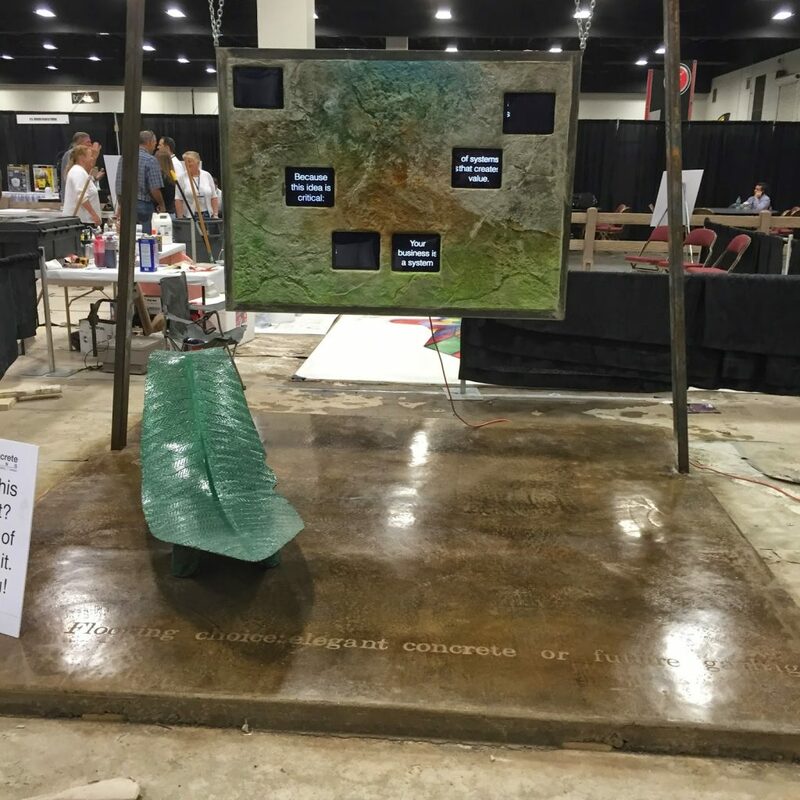 In October 2014, Roadware was exhibiting at the Concrete Decor Show in Ft Worth, Texas. 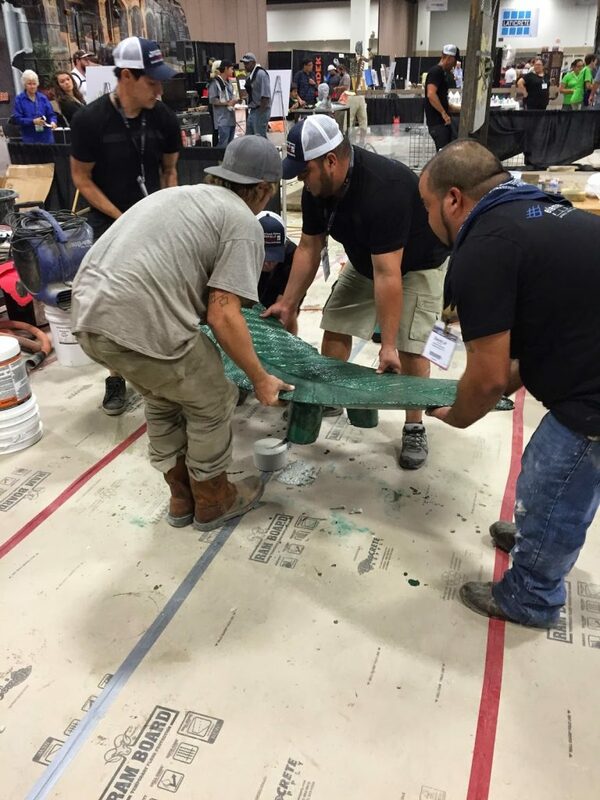 After the first day of the show, I received a phone call from an exhibitor working in the Decorative Concrete Competition at the show. 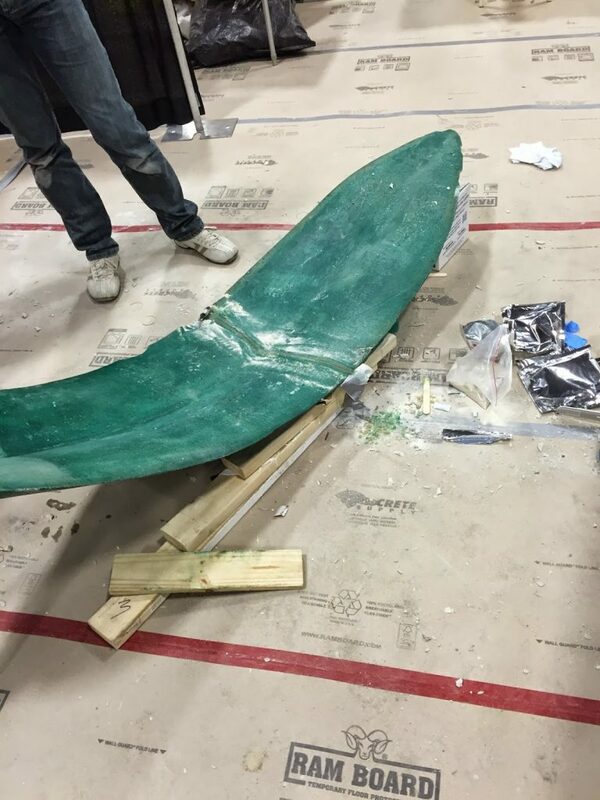 A decorative art piece cracked in half as it was removed from its mold. 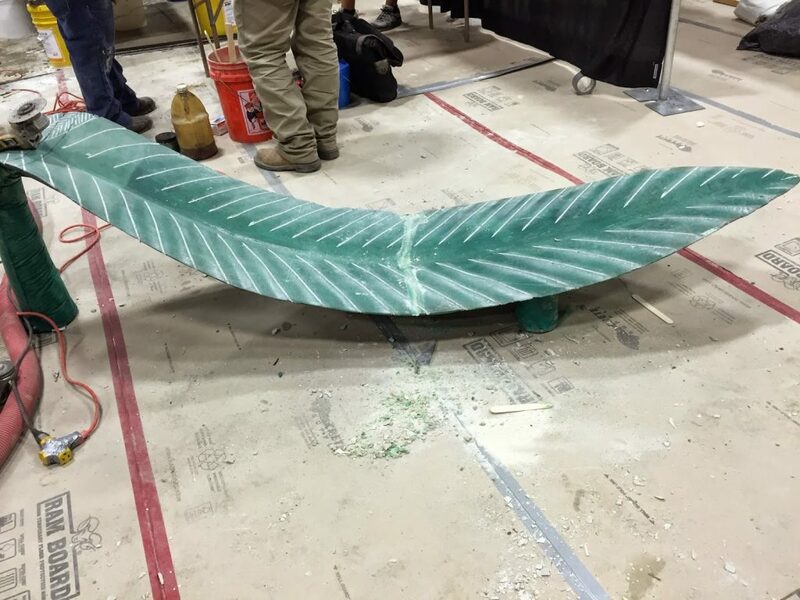 The piece was intended to be a giant leaf shaped chair. The question now was, can it be fixed and would Concrete Mender™ work? I walked back over the show at the Ft Worth Convention Center and this is what I encountered. The “Chair” was broken into two parts right at the critical stress point in the middle. We carefully pushed the two pieces together using care to mate the surfaces as closely as possible and supported the chair with wood 2×4’s and some shims. I then place duct tape on the bottom of the break to hold the Concrete Mender™ in place while it cured. I used two 50ml cartridges of Concrete Mender and 4030 silica sand to make a full depth repair. This is how the repair looked when I was finished. The next morning, we came back and removed the wooden supports and the duct tape. The repair held perfectly. 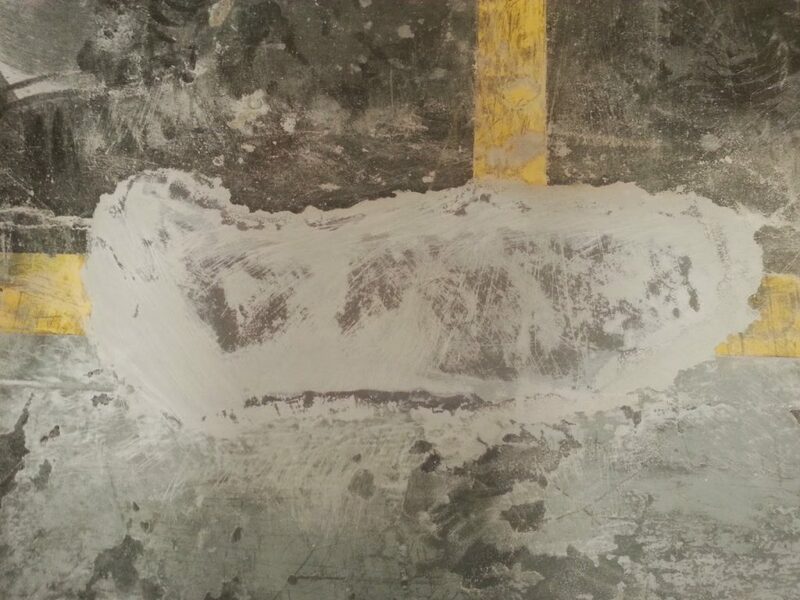 The Concrete Mender has structurally repaired the high strength concrete back together. 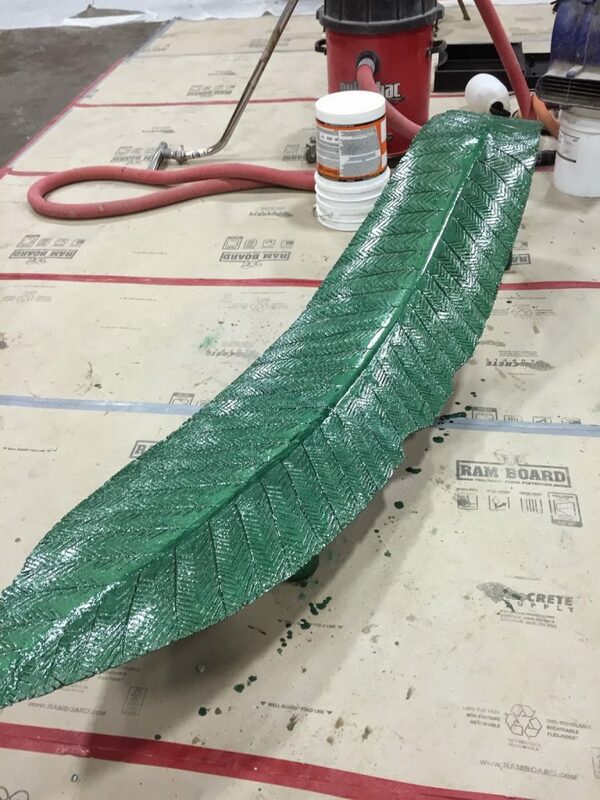 William Reynolds with element7concrete continued with the project by scoring veins in the leaf with a diamond blade. A high gloss glaze was added to the surface. You could barely see the break when the glaze cured. The repair was strong enough the hold together when moving the chair into the exhibit. The finished work help together for the duration of the show and the move out process after. Roadware 10 Minute Concrete Mender™ with its Microdoweling™ structural bonding really saved the day. 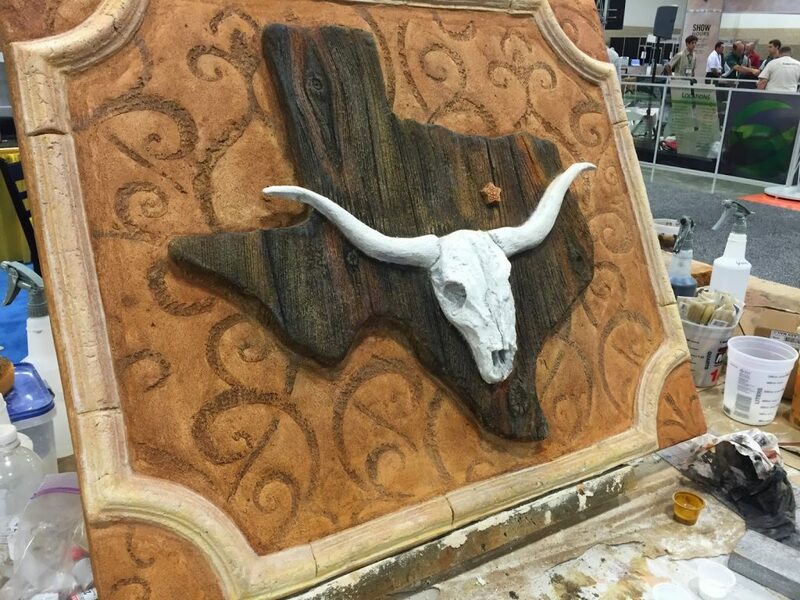 Thank you to William Reynolds with element7concrete in Granite Shoats, Texas for their masterful artistic skills and all their hard work. Once work got out that I repaired the chair, I was call on to repair other projects at the convention like this long horn steer. I use 10 Minute Concrete Mender™ to repair the tip of the horn. You would never know it was broken. Just something I’m working on this week. 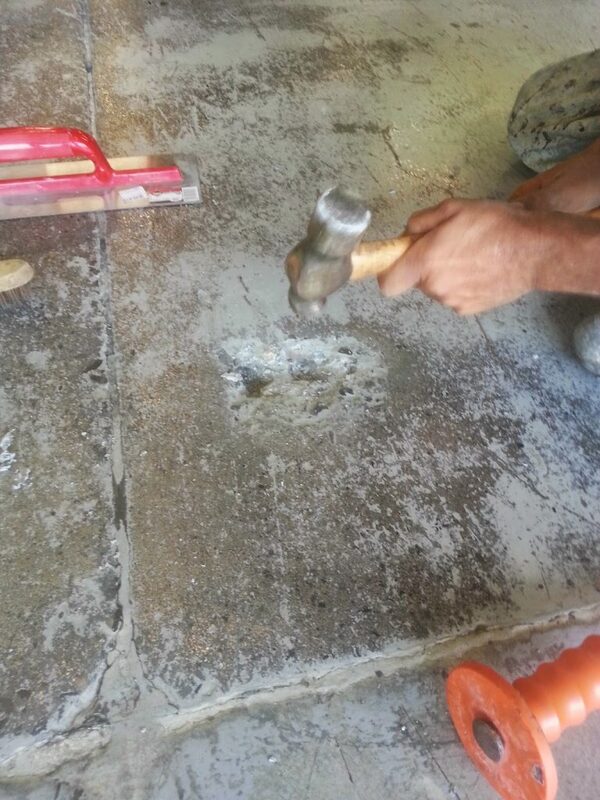 Stamped Concrete Crack Repair with MatchCrete™ Clear. Repair Cracks and Spalls in stamped concrete with MatchCrete™ Clear. 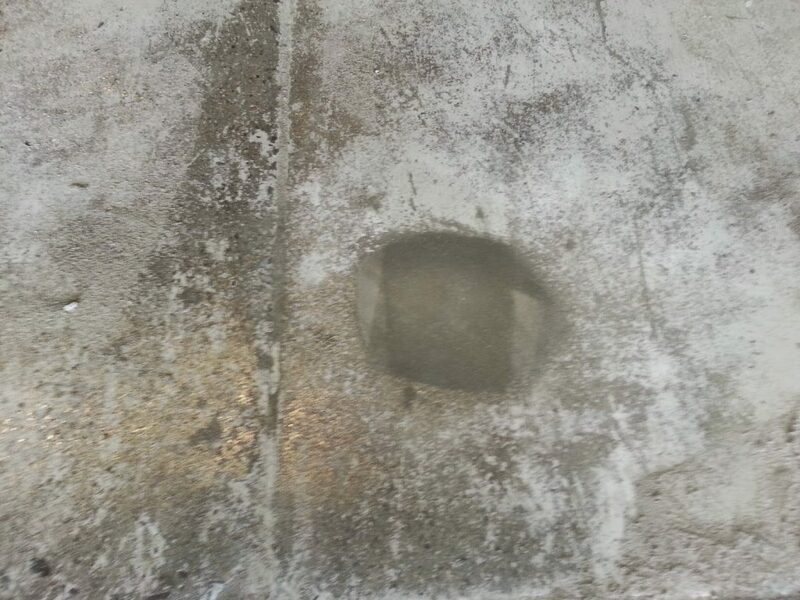 You can use MatchCrete™ Clear Concrete Repair Polyurethane to repair intregal color or stamped concrete. Remove dirt, loose concrete, repair materials or failed caulk. Use a diamond blade to slightly cut open the crack and clean out loose concrete and debris. Use tape to mask off the crack. Gather materials needed to make the repair. From left to right we have some brown concrete pigment, silica sand (43-30 grit), black unsanded tile grout for color, and a mixing cup. Dispence the MatchCrete™ Clear into a cup. 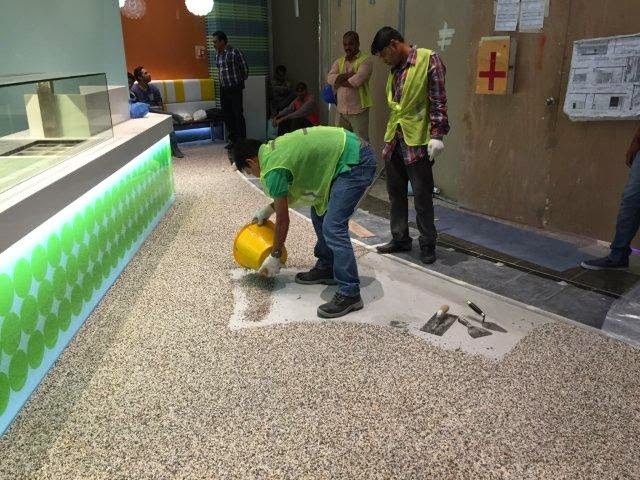 Add a littlt silica sand to give the MatchCrete™ Clear some base color. To create your color, add a small amount of powdered concrete pigment and blend with a mixing stick. Concrete pigments are strong. It just takes a small amount to color the product. Here we are adding some black un-sanded tile grout to the mix to make a closely matching color to the stamped concrete. You can use many types of sand and dry pigments to create the desired color and texture. Blend well by hand for about 30 seconds. You will have about 10 – 15 minutes of working time before the product starts to gel. Work in small batches. Pour the blended MatchCrete™ Clear into the crack. 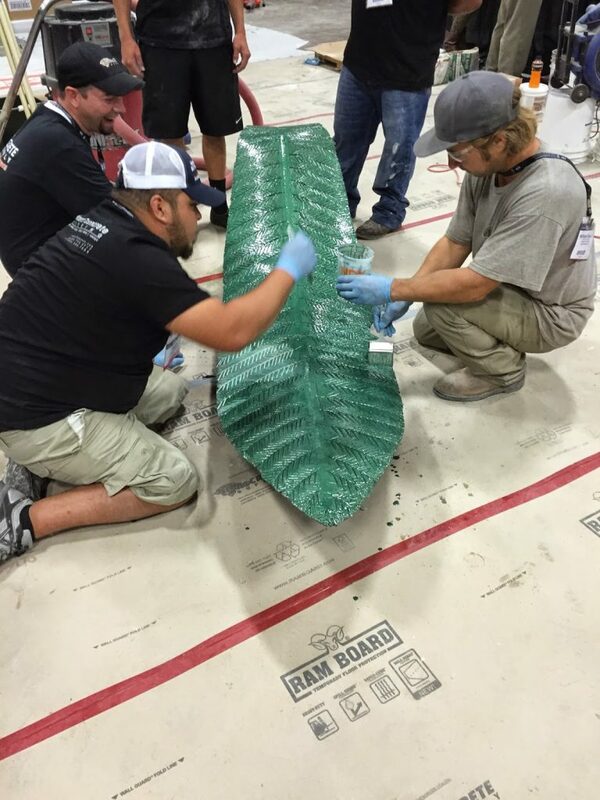 The material will start to gel and can be troweled into place before setting. Allow to set for about 30 minutes and pull the tape. The repair can will be ready for traffic in about an hour. 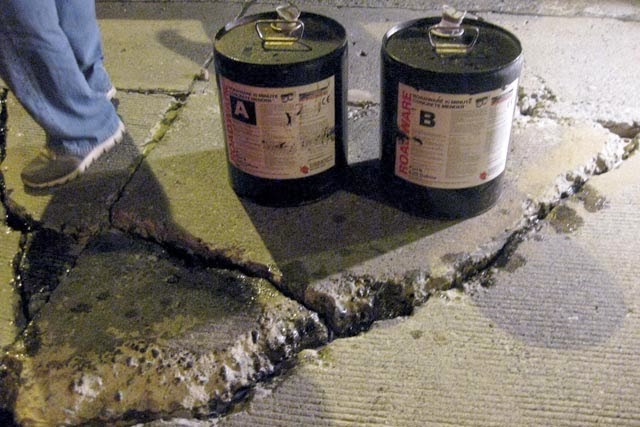 Roadware MtchCrete™ Clear repairs are tough and will not crack apart like cement based materials. The repair is UV color stable and will not become brittle like epoxy. Please click here for a MatchCrete™ Clear data sheet. When the busses have to keep rolling, Concrete Mender gets going. 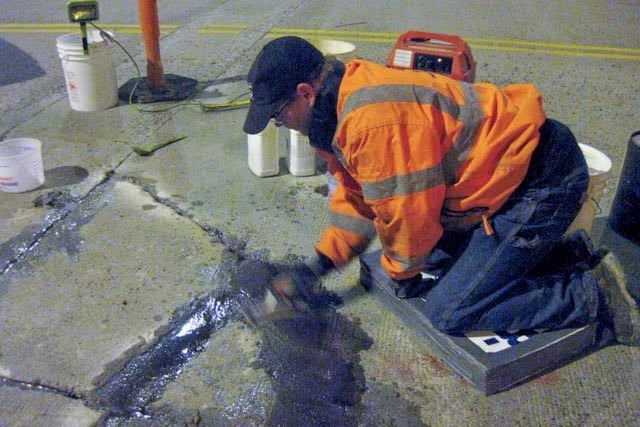 When a city bus garage in the Pacific Northwest needed a fast concrete repair solution, crews turned to Roadware 10 Minute Concrete Mender™. 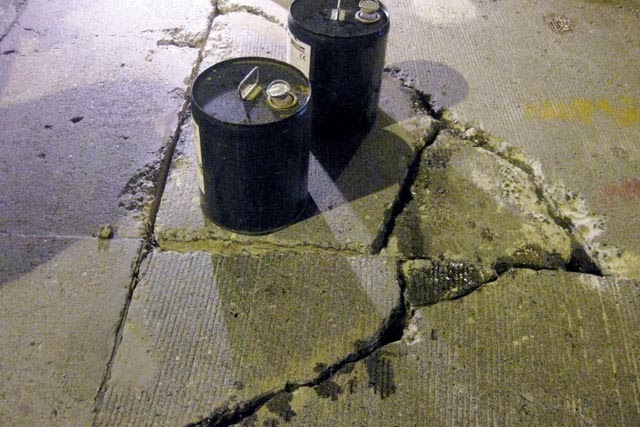 Mission critical concrete repairs is what we do here at Roadware. Facilities like city bus garages have areas that are required to be open and operational 24/7 365 days per year. Roadware 10 Minute Concrete Mender™ is your best choice for fast repairs that have to last. 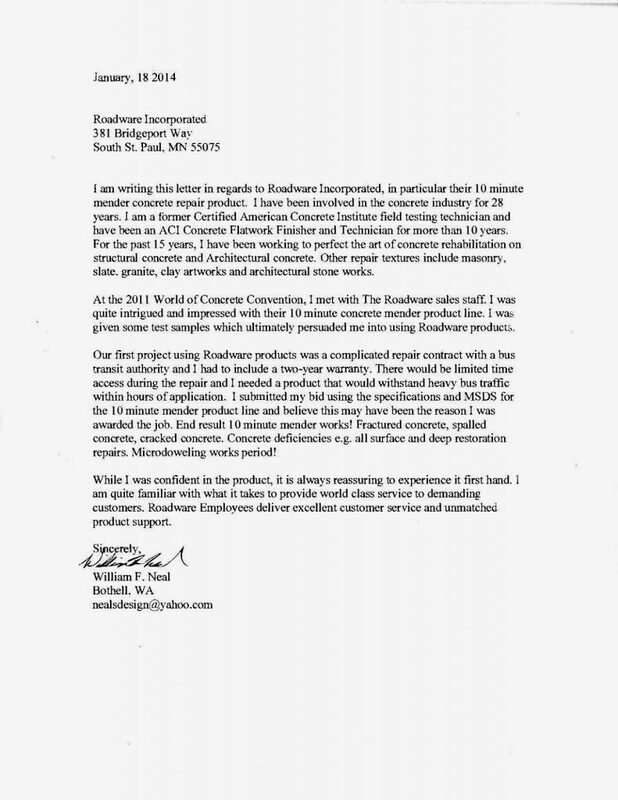 “I am writing this letter in regards to Roadware Incorporated, in particular their 10 minute mender concrete repair product. I have been involved in the concrete industry for 28 years. I am a former Certified American Concrete Institute field testing technician and have been an ACI Concrete Flatwork Finisher and Technician for more than 10 years. For the past 15 years, I have been working to perfect the art of concrete rehabilitation on structural concrete and Architectural concrete. Other repair textures include masonry, slate. granite, clay artworks and architectural stone works.At the 2011 World of Concrete Convention, I met with The Roadware sales staff. 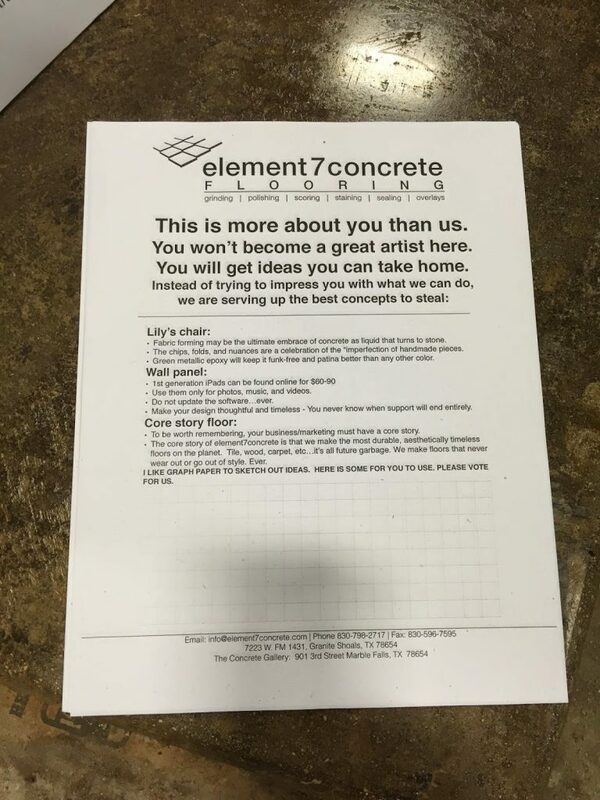 I was quite intrigued and impressed with their 10 minute concrete mender product line. I was given some test samples which ultimately persuaded me into using Roadware product. Our first project using Roadware products was a complicated repair contract with a bus transit authority and I had to include a two-year warranty. There would be limited time access during the repair and I needed a product that would withstand heavy bus traffic within hours of application. I submitted my bid using the specifications and MSDS for the 10 minute mender product line and believe this may have been the reason I was awarded the job. End result 10 minute mender works! Fractured concrete, spalled concrete, cracked concrete. Concrete deficiencies e.g. all surface and deep restoration repairs. Microdoweling works period! The process starts with removing dirt and debris from the cracks and preparing them for repair. Sometimes, remove and replace is not an option. 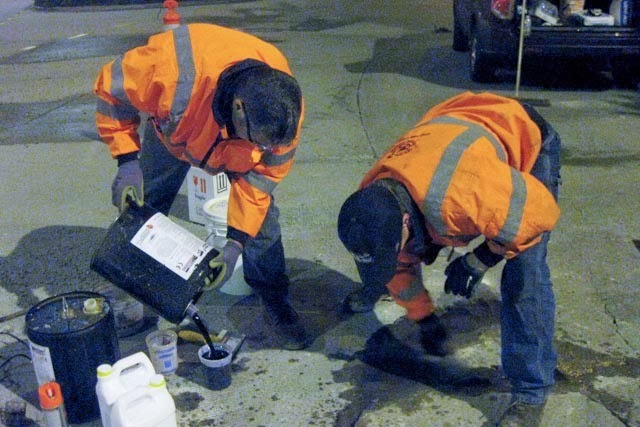 Roadware 10 Minute Concrete Mender™ can have this back in service in minutes, not hours or days. Roadware 10 Minute Concrete Mender™ mixed at a one to one ratio and blended with two parts sand. 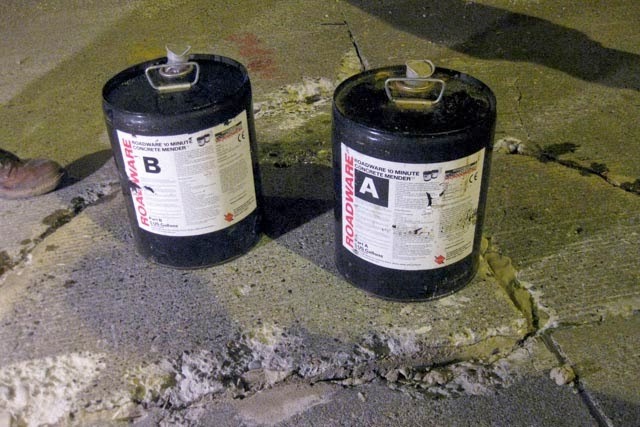 Each gallon of Concrete Mender makes about 2.2 gallons of repair material. 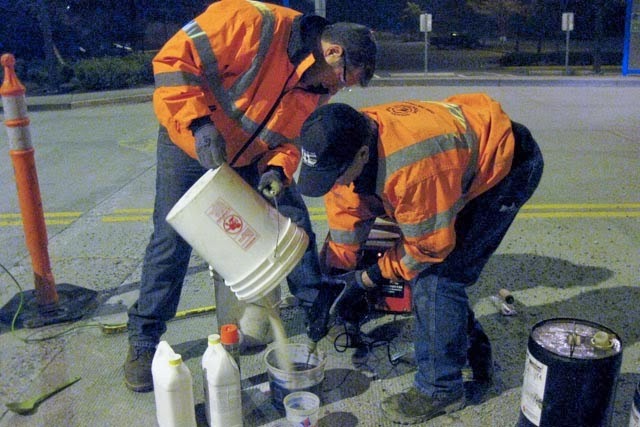 Roadware 10 Minute Concrete Mender™ can be mixed in bulk with simple tools and equipment. Manufactured sand or quartz is added to the Concrete Mender to make a trowel-able mortar. 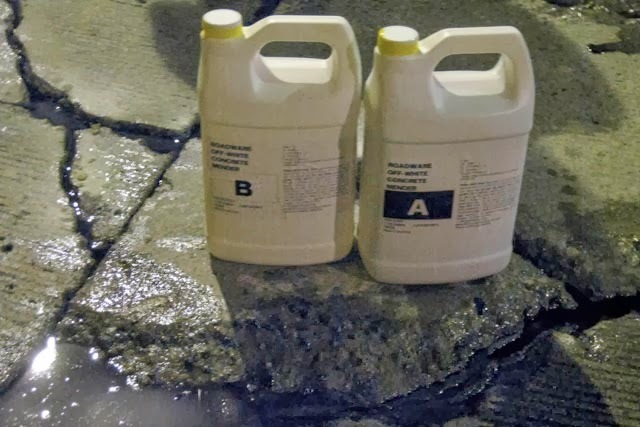 Roadware 10 Minute Concrete Mender™ is available in 10 gallon kits or convenient 2 gallon jug kits. 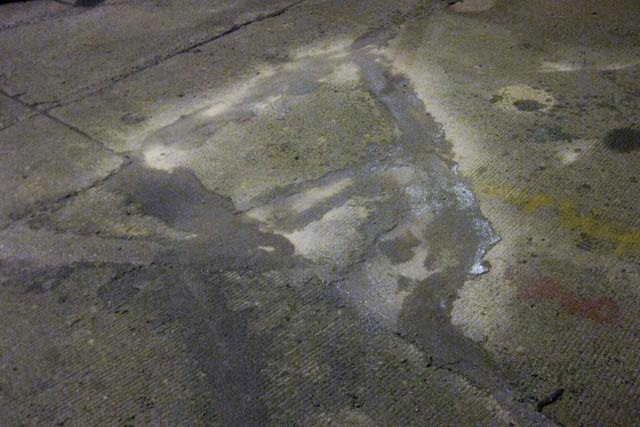 The Roadware 10 Minute Concrete Mender™ blended with silica sand is poured into the cracks and troweled flat. Repairs can be made in all seasons with an ambient temperature range of -20F to 100F. 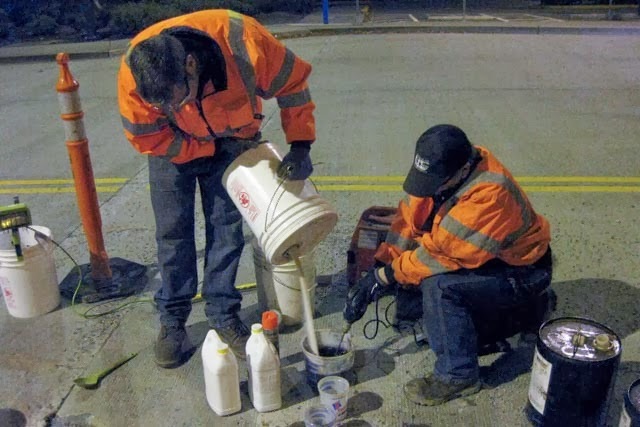 Roadware 10 Minute Concrete Mender™ repairs are ready for bus traffic in about 10 minutes at 70 degrees F.